Now the update: All changes and additions colored. 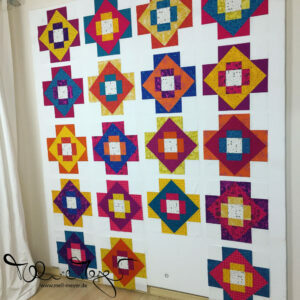 Q2: Finished the blocks for the third border. 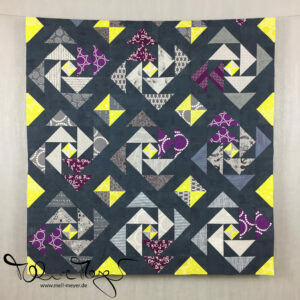 Q3: Second border pieced and connected. And I made an appointment for quilting on a Longarm. Deadline is now the 13. of December. Q4: Finished the top AND quilted it on the longarm. Now I have to bury the threads and bind it. And figure out a hanging option/ sleeve. Click here for the blogpost. Supposed to become something different, I have now decided to change this unwanted project into a baby or toddler quilt. At the moment without an individual in mind – maybe to be a charity quilt. At the moment I have a lot of four patch blocks in kona cotton solids and because I wanted to try out the disappearing nine patch pattern. Q3: Changed my mind from disappearing four patch to a modern four patch like this idea. I didn’t like the proportions whilst simulation a disappearing four patch. Started the cutting for the smaller four patches. My finish for Q4: They have been finished! #YEAH Click here for the blogpost. Those two quilts have once been pieced for a bigger quilting idea, but I don’t like them enough anymore to continue this. So I am rather going to arrange them in two baby quilts then being unfished and unwanted in my home. The first one is already finished. Click here for the blogpost. The quilt No. 2 is now quilted. The binding yet to be finished. 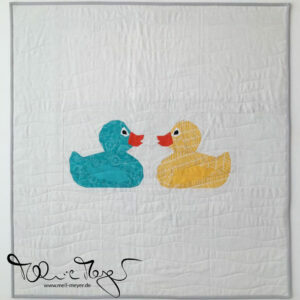 Q3: I have quilted some of my previous blocks and I did as well work on some more blocks. But the backlog is still huge. This quilt is really new in the making. We are still debating fabric and pattern. This one is due 29th of February. So definitely a project for this quarter. You have a great list of projects and are making good progress!